“WhatsApp MOMO” Is The New Dangerous Challenge Found On Social Media App WhatsApp. 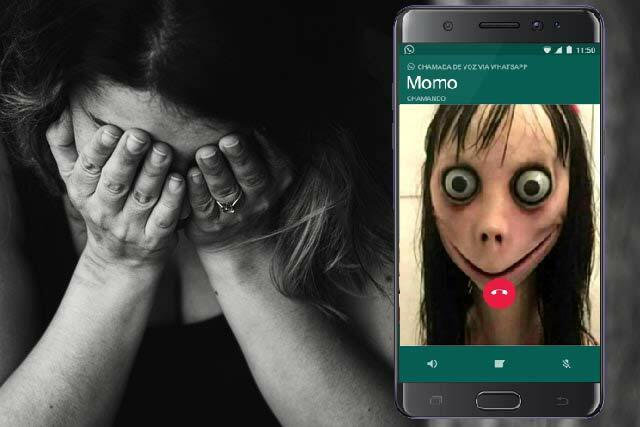 After the terror of "Blue Whale Game" trap, MOMO has come on WhatsApp, who has disturbed the sleep of peoples in Latin America.The MOMO on WhatsApp spreading rapidly across Latin America. Let's know what is the MOMO on WhatsApp? An unknown number is being shared on WhatsApp, which belongs to the Japan. After saving such contact number in the phone, a large-eyed girl photo appears which is horrible to see. Reports are claiming that the person in contact with this profile is encouraged to commit suicide. MOMO WhatsApp is the same as “blue whale challenge”. The user receives the call from an unknown number with the profile picture of MOMO. If you attend it, they threatens you that he will release all your secret information on the internet if you don't do what asked to do by him. The unknown person tries to contact you via whatsapp. Once you get in touch, they threaten you and tries to blackmail. If they think that you can not be cheated by them then they take big steps. They strike on your social media profile, shares distracting videos of the dead, loot, blood etc. After watching those disturbing videos anybody can loose his mental balance. The Blue Whale Challenge was very popular in the year 2016. The first MOMO profile was appeared on the Facebook. Many tried to be in contact with it. The face that appears in the MOMO profile matches a lot with the sculpture of a young woman placed in Japan's museum. Momo is a conspiracy theory whose intention is to create fear in the mind of the people. Security experts tried to reach to the creator of such profile but they couldn’t. Security Expert tried to chat with MOMO number but did not get any response. In such a situation, it is hard to know that whose mind is working behind such activity. If you received the call from such an unknown number with MOMO profile picture, instead of attending just block it. Save only those numbers in your contact list whom you personally know. Keep an eye on what your children are doing on the social media. Install anti-virus or anti-malware in your smartphone. The suspicious link may be prevented to appear by anti-virus software. If you see a change in the behavior of the child, then talk to him kindly. Try to divert his mind from the internet world.